We’ve had a few personal honours in the past few months for our choir members, two MBEs, the ordainment of a deacon, and now we have another rare personal achievement. John L. Jones and his wife Mary from Broadmoor celebrated their diamond wedding anniversary on 10th June and received a lovely message personally signed “Elizabeth R” from the Queen along with a photo of Her Majesty. It will only be a couple of years to the Queen celebrating her Platinum wedding anniversary and no doubt John will return the favour with his photo and a card signed “John L”. John claims to be still active and knowing he is a keen gardener, I assume that is what he means although I do recall when someone in a rehearsal asserted that "most of us are past it”, a voice in a broad Pembrokeshire accent from the middle row of the top tenors did respond cryptically with the comment “speak for yourself”. We had a very good audience on Thursday 23rd July at St. Mary’s church. The evening began differently with Eric Mullins standing in for our chairman to handle the choir’s entrance and exit and putting his years of police marching experience to good use to organise a very efficient “staging” process. Perhaps this will become a regular feature so that accompanist Jill Williams may not be encouraged to play the theme tune from Dad’s Army as we exit the stage. Fortunately Eric did not ask us all to greet the audience with “Evenin All” – not this time anyway. The main solo spot for the evening was provided by our principal soloist second tenor Paul Varallo who sang Some Enchanted Evening, Bruscia La Terra Mia, Y Darlun and Bless This House. Tom Pierce also sang solo in My Little Welsh Home. We are grateful to local butcher Andrew Rees for sponsoring the concert. It seems we are in great demand at the moment for all sorts of engagements, we have a backlog of charities wishing to book us for a concert, we have wedding invitations, outdoor concerts at Lawrenny, Cresswell Quay and both Tenby and Saundersfoot harbours, have just sung at Pembroke Castle with Only Men Aloud and now we are delighted to be invited by Specsavers the national eyesight partnership with over 2000 branches to sing a number of concerts at stores in Pembrokeshire and Carmarthenshire. 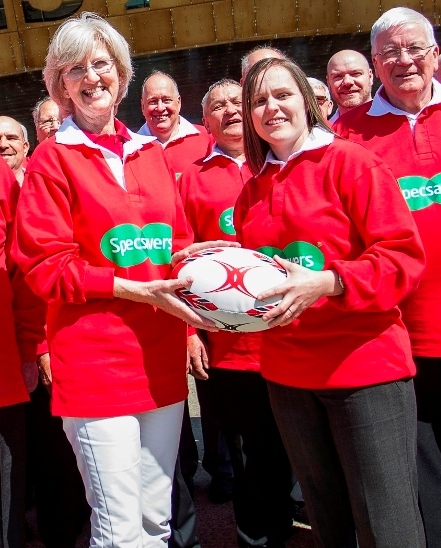 This is a national campaign by Specsavers to raise money for the Wales Deaf Rugby Union . This is all part of celebrating the coming World cup and has a rugby theme with the choir wearing Specsavers rugby shirts and singing at their stores. The “Specsavers’ Choir” will be singing tomorrow between 12pm and 4pm at the Dimond Street, Pembroke Dock store. It should be a great occasion so planning your weekend shopping to be in Pembroke Dock on Saturday would be a great move. The picture shows Paul Varallo with members and accompanists of the Maesteg and Caerphily choirs at a recent planning meeting for the campaign. There is a full press release on our website. We won’t really be able to draw breath before we have two further concerts next week. Firstly on Tuesday 4th August we will be at St. John’s church, Tenby at 8pm and then its down by the river on Friday night with an outdoor concert at Creswell Quay. There is no entrance fee for the outdoor concert and a barbecue will be available. My grandchildren haven’t stopped asking me when the Cresswell Quay event is as they enjoyed it so much last year. It’s a great family evening out – weather permitting, of course. The new choir CD called Hwyl a Hiraeth is proving very popular with attendees at the concerts and they can also be bought on our website for which there are details below. New members and supporters are always welcome and anyone can come along to a rehearsal or concert and learn about what choir membership is all about. Rehearsals are on most Tuesdays and Thursdays unless we have a concert on one of those nights. So come along, have a listen and discuss what it’s all about with other members with a post-rehearsal pint to learn how you can support the choir or talk to us if you have a view or some doubts. We are always interested in people’s thoughts about the choir especially those of younger people. There is plenty of information and interesting stuff on our growing website including video clips. The website can be found at www.tenbymalechoir.org. There are contact details and different ways in which you can get to know more about it all.